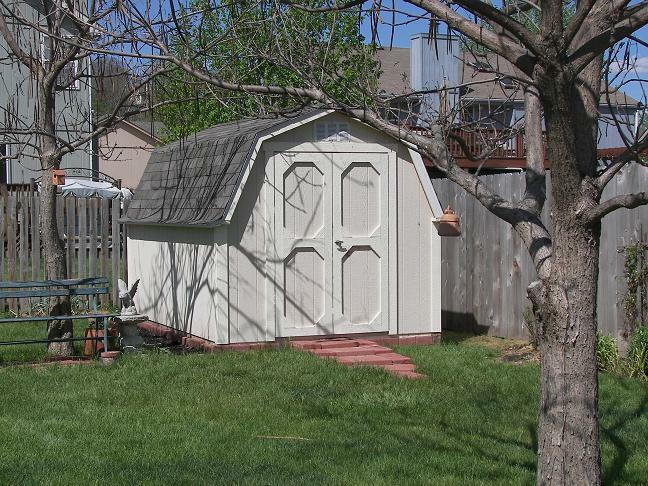 ​Kansas City's Premier Portable Storage Shed Provider! Welcome to our storage shed, garage and cabin building site. We are Cedar Built USA, a locally owned and operated company based in Missouri and serving Blue Springs, Independence, Lee's Summit, Raytown, Overland Park and most of the areas surrounding Kansas City. We have been serving our customers here in the heartland since 1991, and we are proud of our reputation. We have been helping our friends and neighbors find the perfect storage shed, garden shed, cabin and garage building solutions available in Missouri. Our quality and service is the reason why we are considered the best building manufacturer. We always strive to deliver the very best customer service to everyone who we deal with and this ensures that we find exactly the right portable storage shed building solution for them. Our customers expect us to deliver the highest quality product at unbeatable prices, and that is exactly what you get from us. We are passionate about our design and construction, and if a door window does not open or close properly, a corner isn't properly braced, or a seam isn't properly caulked, our standards have not been met. Believe me, we have high standards! This is why we can be confident and offer a 5-year warranty on all workmanship and materials and even a 1-year warranty on our Economy sheds! The longer you live on a property, the more things you accumulate, and many of them are things you just can’t part with. We all have things that clutter up our homes, and finding the right way to store everything can be a challenge. It can be difficult to try and fit all the things you need into your home or your garage and maybe... just maybe, you'd like to be parking your car "in" the garage? You now have the answer with a storage shed solution from Cedar Built USA. We’ll work with you to find the best options for your particular site and fit right into your budget. Our supreme portable storage building offers the best materials and the highest quality to make sure they last for years to come and we offer a 5-year warranty on our supreme portable shed buildings. 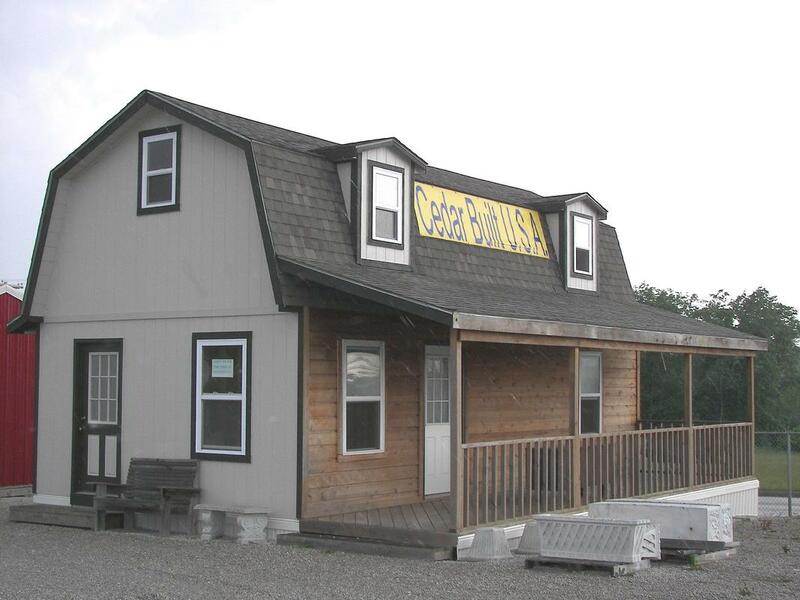 You might want to go for our most popular portable building, The America. 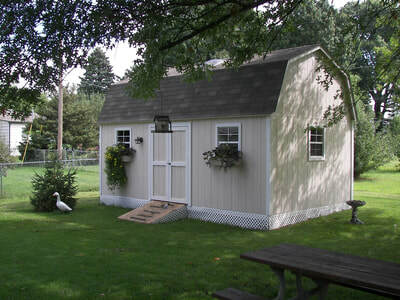 With a choice one-story, two-story or loft, you can get this portable shed in a variety of sizes to suit your needs. As with all of our products, you are important in the process. We will discuss all the details about what you need so that we can offer you the best solution. If you are looking for something more modest in size, you might find The Patriot is what you are looking for. This versatile shed is great for those that love gardening or want somewhere to store their bikes, barbeque or any other garden furniture to protect it from the elements. We can make the shed to your requirements in any size from 10’x8’ up to 20’x12’. With one of these beauties in your back yard, you’ll have a stylish space that will look amazing in your yard. many other possible uses. 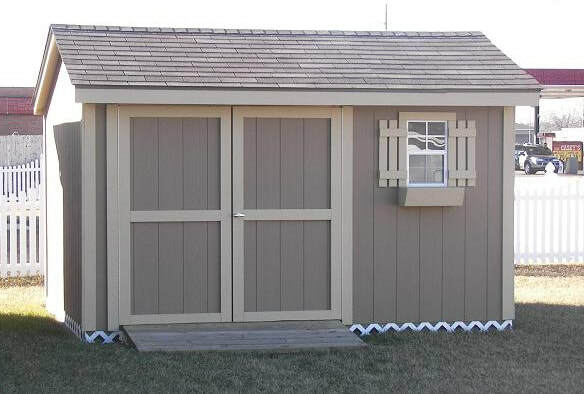 Not only is it a good storage building option, it would also be great as a child’s play house during the summer months. It has a simple yet classic design that fits in with any type of yard. For those on a smaller budget, we design and build an economy storage shed building that still offers exceptional quality and reliability, but at a smaller price. It is the perfect solution for those that want a place to store things such as garden furniture, mowers, bikes or just about anything. It is still constructed to our high standards, and you’ll get our limited 1-year warranty to give you the peace of mind you expect from us. If you need some indoor space to store your cars and you don’t have a garage, then we can help you with one of our impressive portable garages. You’ll have a wealth of choice depending on what you want. You can also have gable or barn style and you can take advantage of the many customizable features including your choice of windows, stairs, and vents. This means that as well as having a space to park your car, you can also have an area to store tools or work on your car without having worry about space. Regardless of the size of the land you have to work with, we can help you find a garage that will meet your needs. All you need to do is give us a call and we can give you a FREE on-site estimate within a 50-mile radius of Cedar Built USA. Protect your vehicles from the weather and give yourself some additional storage with a customizable portable garage from us. 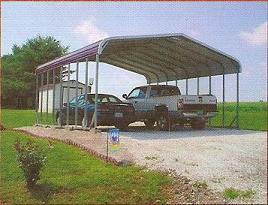 If you don’t need a full-sized garage, or you are just looking for somewhere to park your vehicle to keep the sun and rain off, then you can choose one of our great carports. They come in a variety of sizes and shapes to suit anyone’s needs. You can choose from just a roof with sturdy supports, a barn style carport with an open front and back, or you can get a mixture of part open sided with an enclosed area at the back for tools or for additional storage. You don’t have to worry about the size of vehicle you have because we have carports that can accommodate everything from a holiday home to a motorcycle. 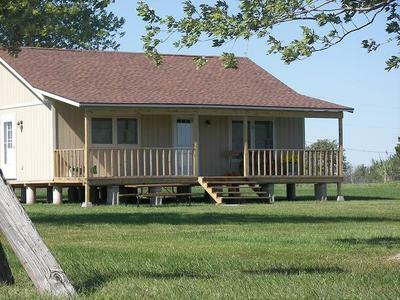 Do you have some land away from home that you want to put to good use as a weekend getaway? Maybe a hunting of fishing cabin away from the hustle and bustle of the weekly grind? Maybe you just want somewhere for guests to stay when they come to visit you at home? Well, we may just have the perfect solution for you. We have a wide range of specially made [portable] cabins that come in various shapes sizes and configurations. These beautiful buildings offer a strong, well-built and impeccably designed structure for your guests to use as a home while they visit with you. They are also the perfect cabin at the lake, or hunting camp. ​We believe in giving our customers the best service possible. 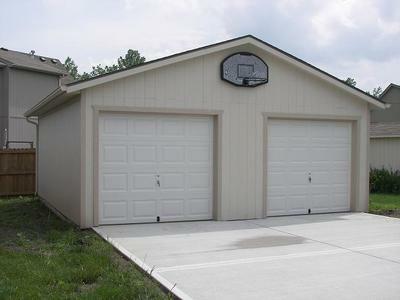 To do this, we make sure that you get the backyard storage shed building that you want. Our team will arrive to assess the area and discuss your portable storage building, garage or cabin needs. We’ll then create a shed to your needs with a quality design that will fit. 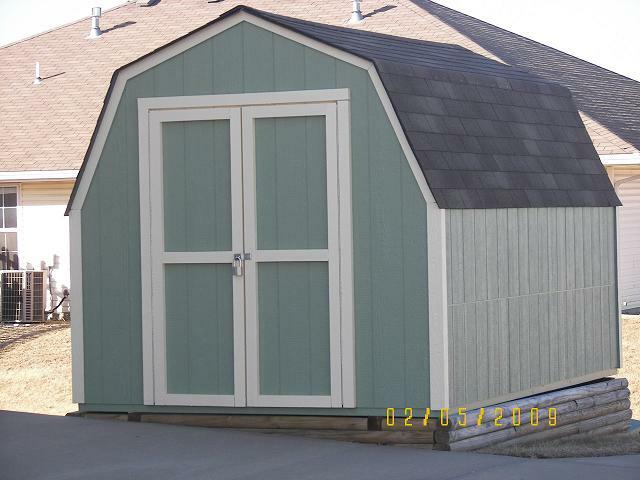 We only use superior materials for our sheds, because we know that our customers expect that. Once the design is finished, we’ll build your shed on site and we won’t finish until it all fits the way it should. It is because of this commitment to our customers that we can offer a 5-year warranty on all workmanship and materials and a 1-year warranty on our Economy portable Buildings. With shed display locations in Oak Grove, and Indep, we can serve the whole region and have done so for many years. If you buy a storage shed building from us, you will get free delivery within a 50-mile radius, and if you live further out don't worry, we’ll offer you low shipping rates. And remember that you also get a FREE estimate within a 50-mile radius as well, so there is a lot to love from choosing your garden shed from us. Buying from us is also easy, we accept all major credit cards or you can simply pay cash on delivery, the choice is yours. If you want to spread the payments a little, you can do so with our 90-day approved credit for those who qualify. We also offer a “Rent-To-Own” program with no credit check! Why not become the envy of your neighborhood by investing in a high quality, purpose-built, portable shed from Cedar Built USA? We can give you the perfect headquarters in your backyard and all the storage you need. Please Call Us For Current Specials!